The electric toothbrush I've had for around 10 years died yesterday. I mourned for a little while and then cheered up when Mickey told me to look on Amazon for a new one. It came today. I was so excited! Doesn't the new one look much better than the old one? 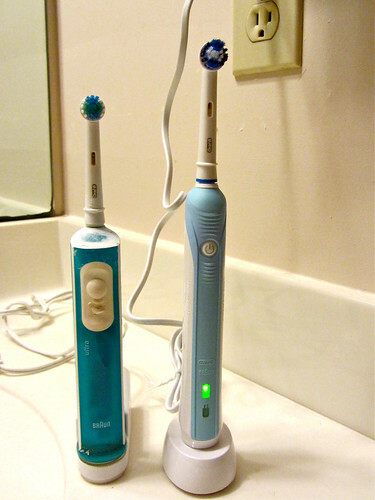 They both look way better than the sad little toothbrush I've had to use the last few days. I thought I was going to break it because the handle is not hard like an electric. My teeth just don't get clean enough with those regular old brushes. I have totally converted to electric and will not go back.